While I’m on a bit of vacation, I have decided to re-post some items from the first year of this blog (2007). This item first ran on December 29, 2007. As I have mentioned previously, I enjoy shooting. And I carry a concealed weapon (legally – by permit and where allowed by law) pretty much all the time. This isn’t paranoia, just a simple recognition that we live in an unpredictable and sometimes dangerous world. That same mindset applies to preparations for any kind of small-scale disaster, whether natural or man-made. If you live in the Midwest, you understand that power outages occur due to weather (tornadoes in Spring, Summer, and Fall, ice-storms in Winter), and that you may need to be self-reliant for days or even a couple of weeks. I’ve long abided by the Scout motto of “Be Prepared”, and while you wouldn’t find a years worth of supplies and a generator cached here, we could manage pretty easily for a period of a couple of months. That’s not too far off what is recommended by both the government and independent health agencies. As I’ve discussed, the onset of a pandemic flu may well cause a disruption of normal economic activity for a prolonged period, and I cite such a disaster as the background for Communion of Dreams. Anyway, in an accident during one shooting trip this fall I managed to slice open my right thumb pretty well. I had ridden out to the family farm where I usually shoot with one of my buddies, so didn’t have my car, which contains a fairly complete first-aid kit. And, as it turned out, my buddy didn’t have any kind of first aid supplies in his car. We improvised a bandage from stuff in my gun cleaning kit, and things were OK. When I got home, I added a real first aid kit to my ‘range bag’, and didn’t think much more about it. Then, a couple of weeks later I was back out at the farm with my BIL. We were walking the border of the property adjacent to a state park and marking it as private, since a lot of people don’t bother to keep track of where they are and we’ve had a lot of tresspassing. At one point down in a secluded valley my BIL and I paused for a breather, and just out of curiosity I checked to see if I had a signal for my cell phone. Nope. Hmm. Now, it was nice weather, just a tad cool and damp when we set out. But it was November, and the leaves were slick in places where a fall could easily result in a twisted knee or a broken bone. I got to thinking – if I were on my own, what did I have with me that I could use in the event of an emergency? Oh, I had plenty of stuff in my car – but that was the better part of a mile away. What did I have on my person? In truth, I was in better shape than most people would likely be in such a situation. I always have a Leatherman multi-tool on my belt, a small LED flashlight on my keychain, and a pistol and ammo. But still, since I don’t smoke I’m not in the habit of carrying matches or a lighter, I once again didn’t have any first-aid items, et cetera. I had stuck a small bottle of water in my jacket pocket, but that would hardly last long. I could probably cobble together some kind of splint or impromptu crutch, but it would be a challenge to get out of such a situation on my own. When I got home I got to doing a bit of research about emergency survival kits. Google that, and you’ll come up with about 30,000 hits to sites offering everything from bomb shelters to equipment for first responders. Not particularly helpful. I decided to take a different tack, and started to think about what I wanted to have in a kit small enough that I would *always* have it with me. 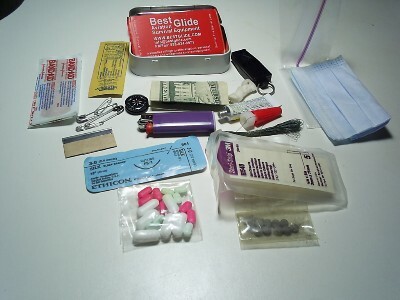 I set my goal for constructing a kit which would fit into an Altoids tin, since that is small enough to easily slip into any pocket. In searching out the items I wanted (difficult to find items linked to my sources), it became clear that in some cases I would spend more on shipping for some of the components than I would for the actual items. So I made one such kit for myself, and another half dozen to give to friends. That got the cost down to under $10 each (not including the cash, obviously). Your best survival tool in any situation is your brain. But it doesn’t hurt to have a few advantages in the form of useful items close at hand. With this small kit, and what I usually have with me anyway, I am reasonably well prepared to deal with most situations that I can envision. And I thought that since I went to the trouble to construct it, I would put the information about it here for anyone else who might have some use for it.